Christmas is just around the corner, which means it’s time the familiar scent of pine filled your home—because we all know the festive season isn’t really complete without an extravagantly decorated tree. To make things easy for you, we’ve created this list of the best places to buy your Christmas tree in Auckland this year—now you have no reason to procrastinate! None of that fake business, unless you're allergic. In that case we shall make an exception. Misa Christmas Tree Farm know their stuff—they’ve been around for 78 years and have become the go-to Christmas tree spot for a lot of Aucklanders. This Mt Eden farm has a range of different sizes fit for any household and even has giant Christmas trees for the most extravagant Christmas-lover. Hand-picked and freshly cut, Festivity Christmas Trees offer both delivery and pick up, or, if you’re keen to bask in that festive pine needle scent there are four retail outlets to choose from. Catch them at Howick, Kohimarama, Pt. Chev and Balmoral to get into the festive season with a fresh and vibrant tree. Shopping for Christmas trees ain't always easy. 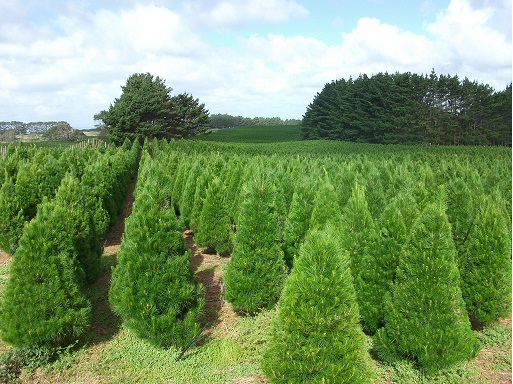 But listen up West Aucklanders, here is your chance to choose your own from the Whenuapai Christmas Tree Farm, or make it easy for yourself and pick one from the barn. They are well experienced in this field as they have been around for over 20 years so it is ensured that the tree is fresh and looking fancy this Christmas. St Nick’s cultivates each tree for more than three years and are cut in the morning to get to you that day. St Nick’s do both pickup and delivery—no excuses to put it off this year. Is there anything better than the smell of a fresh Christmas tree? Offering a variety of different types of Christmas trees, Mount Gabriel Christmas Tree Farms, offers a free wrapping service and, it’s is open until Christmas Day for the real procrastinators. Get your best tree-picking hat on and nab the best tree early with Pickapine’s tagging service, where you can choose your tree and pick it up when you’re ready. Win-win. The Christmas Tree Company usually sells out before Christmas Day, so get in quick. Offering home delivery and set up, you’re just left with the best part—decorating. Getting in the Christmas spirit but have limited space? Noel’s Christmas Trees offers table topper Christmas trees, as well as standard and premium trees. Some of the best Christmas trees in Auckland if we do say so ourselves. DIY Christmas Gifts We Love!